This is the link version of F-335 II running on one board and only one screen per player. Up to 8 games can be linked together. F355 Challenge is Yu Suzuki’s digital tribute to the Italian prancing horse (Suzuki himself drives a Ferrari). 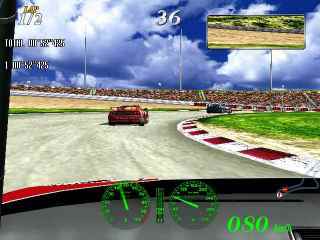 Unlike other driving games, this one features but a single car – the Challenge version of the Ferrari F355 F1. Ferrari’s Challenge program has been around since the days of the 348, and it is designed to give Ferrari owners a chance to test their mettle against their peers on professional racecourses. 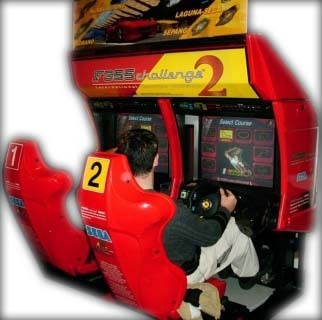 To that end, there are nearly a dozen faithfully reproduced tracks available in F355 Challenge, as well as a wide range of gameplay options. The game’s graphics are as realistic as every other aspect of F355 Challenge. Each F355 is modeled with an amazing level of detail – even the calipers and cross-drilled rotors are visible in between the five-spoke wheels of the car. During replays, the Ricarro bucket seats are easily distinguishable from outside the cockpit as well. 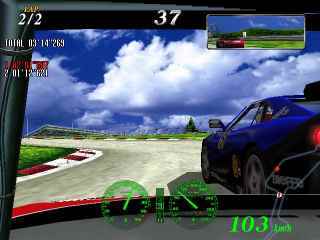 Each of the game’s ten tracks are the most faithful recreations of their real-world counterparts that you’ll find in any game.